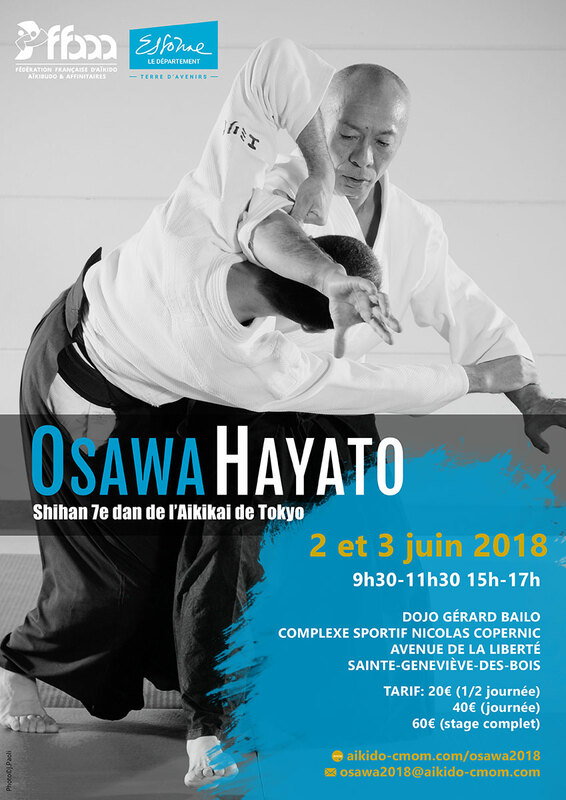 FFAAA Essonne is pleased to announce the visit in France of Osawa Hayato Shihan 7th dan, instructor at the Aikikai Hombu Dojo in Tokyo. 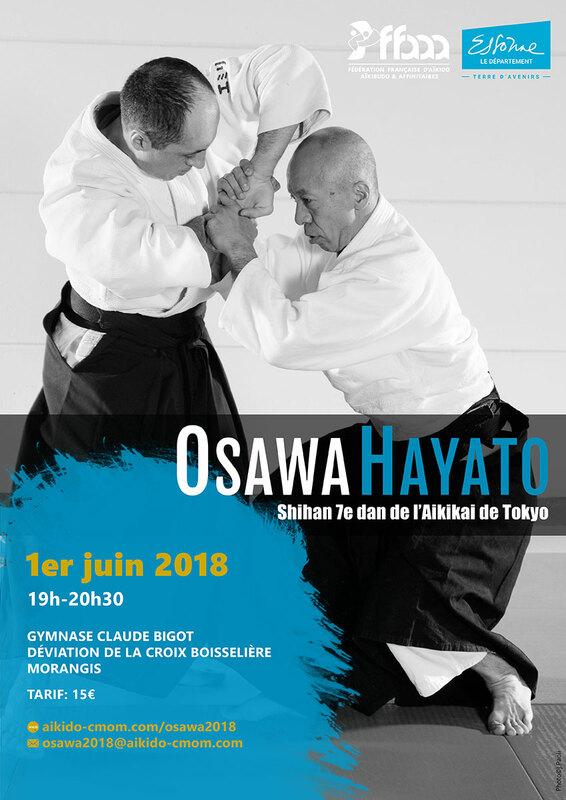 Osawa Shihan will honor us by leading a seminar from June 1st to June 3rd 2018 in the cities of Morangis and Sainte-Geneviève-des-Bois located close to Paris. Participants registration will begin 1 hour before the starting time of the classes and close 10 min before the starting time of the classes. Participants should align and wait in seiza at least 5 min before the beginning of each class. Weapons (bokken, jo, tanto) are not necessary. Spectators are authorized as long as they follow the rules of etiquette and courtesy of the dojo (proper clothes, quietness, restrain from moving back and forth from the seats, no photos/videos). All aikido practitioners are welcome to attend the seminar (above 3-kyu recommended) upon presentation of a proof of affiliation to an organization/group recognized in France by the UFA or by the Aikikai Foundation for a foreign organization. French practitioners need to possess a valid license. Foreign practitioners need to ensure they possess an insurance policy covering personal accident and offering personal liability protection. In order to facilitate registration process, participants are invited to fill the online pre-registration before May 19 2018. No pre-registration fee is requested. Payments will be handled directly on the day of the seminar at the registration counter. In case of cancellation or modification of your registration, please contact us directly. Paris-Centre Car A6 on exit ‘Chilly-Mazarin’, then D118 for 2.5 km towards Morangis. Train/bus RER C to Savigny-sur-Orge (30 min), then Bus 492 towards Place de la Libération up to Place Lucien Boilleau stop (13 min every 15 min), then 3 min on foot. Charles-de-Gaulle airport (CDG) Taxi Estimated time: 45min-1h15 (50km). About 115 euros. Train/bus RER B up to Saint-Michel-Notre-Dame (40 min), then RER C up to Savigny-sur-Orge (30 min), then Bus 492 towards Place de la Libération up to Place Lucien Boilleau stop (13 min every 15 min), then 3 min on foot. Orly airport(ORY) Taxi Estimated time: 20 min (8km). About 35 euros. Bus Bus 191-100 towards Yerres Gare RER (12 min every 30 to 60min), up to Albert Sarrault stop then walk 130m up to Sembat. Bus 399 towards gare Massy Palaiseau, up to le Stade stop (12 min every 10 min), then 2 min on foot. Paris-Centre Car A6 on exit ‘Viry-Châtillon/Fleury-Mérogis’, then D445 for 1.5 km, then at the roundabout towards Sainte-Geneviève-des-Bois. Continue for 1.5 km then on the left. Bus line 1 (15 min every 30 min) or Bus line 3 towards Petits Champs (10 min every 30 min) up to Joliot Curie stop, then 2 min on foot. Charles-de-Gaulle airport (CDG) Taxi Estimated time: 50min-1h15 (57km). About 130 euros. Orly airport (ORY) Taxi Estimated time: 25min-45min (15km). About 45 euros. Train/Bus Bus 191-100 towards Yerres Gare RER (25 min every 30 to 60min), up to Juvisy, then RER C up tp Sainte-Geneviève-des-Bois (10 min), then Bus line 1 (15 min every 30 min) or Bus line 3 towards Petits Champs (10 min every 30 min) up to Joliot Curie stop, then 2 min on foot. From 32€ per room. 75 rooms for 1 to 3 persons 30 double, 19 triple with 1 double bed + 1 bunk bed, 16 triple with 2 single beds + 1 bunk bed. 5 min on foot to Petit-Vaux station (RER C). [A] No, but for organization purpose it is highly recommended. Thank you in advance for your cooperation. [Q] Are there individual lockers on the premises of the venues? [A] No, there are no individual lockers. The changing rooms will be locked during the seminar. Personal effects and valuable items remain under the responsaibility of their owner. The organizers will decline any responsibility in case of theft or loss. [Q] Is it possible to take photos/videos during the seminar? [A] Without any explicit authorization from the organizers, photos/videos during the seminar are forbidden (including from the audience seating). Photos/videos before or after the seminar are authorized. [Q] Are there any laundry shops close to the venues?